Powers/Abilities: Mostly unknown. Energy manipulation, levitation, light emission, teleportation. It is very probable that he possessed the powers of Silver and Auric, augmented in intensity. History: (Alpha Flight I#121) - Hedison was among the crew of scientists and technicians who examined the Target Technology Complex after it exploded. The potent energies released by the Sphinx in the implosion within the Complex had imbued the lifeless bodies of Silver and Auric. Hedison followed a form of kinetic energy and was approached by the two corpses of Silver and Auric. They touched Hedison and transferred part of the Sphinx' power to him. (Alpha Flight I#121 - BTS) - Hedison reported the event. The news was heard by the Brass Bishop who decided to use the power released by the Sphinx and to sell it to the highest bidder. The Bishop and the Chess Set kidnapped Hedison and stole the corpses of Silver and Auric. The Bishop built a device for transferring the power inside Hedison, Auric and Silver into fourth subject and contacted many criminals for the auction. 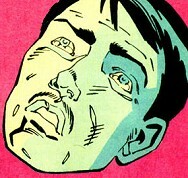 (Alpha Flight I#121) - Hedison was held unconscious during the auction. He and the lifeless bodies of Silver and Auric were linked to the power-transfer device and then to the Nexus, the cocoon the fourth subject had to enter to receive the powers released by the Sphinx. Alpha Flight and Spider-Man assaulted the Chess Set and the criminals present at the auction, but when Nemesis destroyed the Nexus of the power transfer device, it exploded. The Sphinx' power then converged in Hedison's body and created a new whole being, a union of the three bodies and the power which had been divided in the three bodies. The new being was angry and sought immediately revenge against those who denied him life. Two giant hands of energy grabbed the Chess Set members. 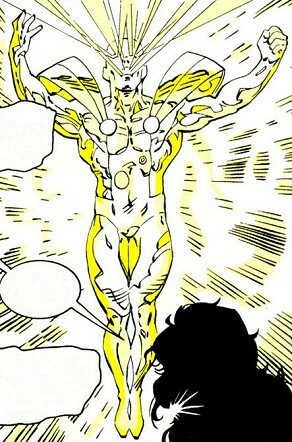 Guardian spoke to the entity and convinced him to honor the life, the same life which Silver and Auric fought for. The powerful entity agreed with Guardian and left the criminals in the hands of Alpha Flight, then disappeared in a glow of light. I'd say that the new being is more Hedison than the two Asian heroes. The bodies of Auric and Silver were probably animated by the energies released by the Sphinx and didn't possess their own conscience, soul or mind anymore. They were dead. So, the new being and the whole energy was mainly hosted by Hedison's body and mind, and the contribution of Silver and Auric were limited to the physical appearance and to the powers transferred to the new being.